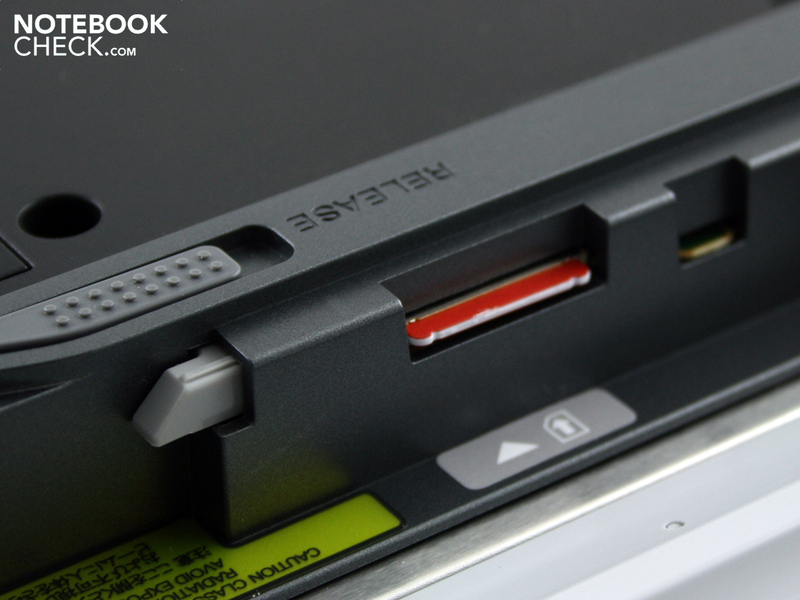 Sony Vaio VPC-Z13Z9E/X: The Quad-SSD opens the throttle and the full-HD panel beguiles the eye. 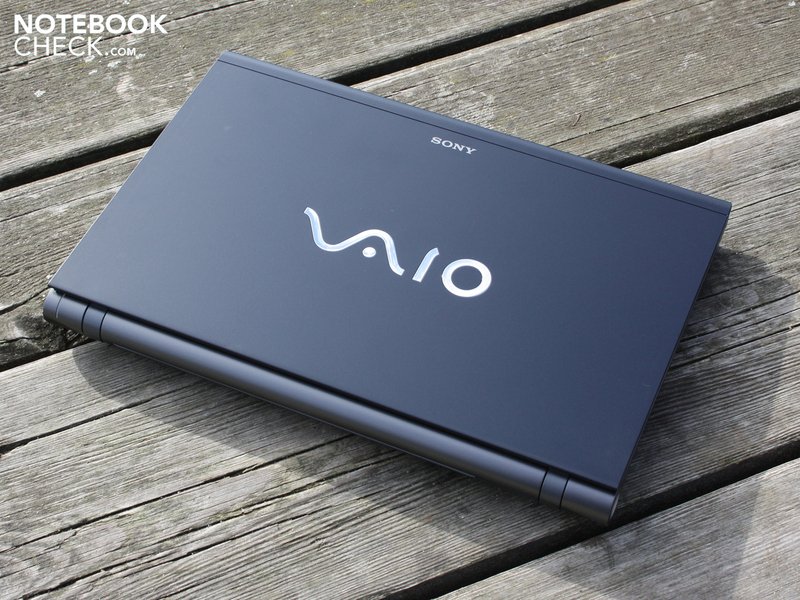 For those who really want to treat themselves and don't consider price to be an issue will find a suitable subnotebook in the Vaio Z-series. It's not just the price of the max-configuration which seems exalted at 3,299 Euros (VPCZ13Z9E/X); the technical data also contains everything held high in name and prestige among tech-fans. Here the inclined buyer can even forgive the fact that the 13.1-incher isn't housing a brand-new Sandy Bridge Core i7 with High-End-Power graphics. 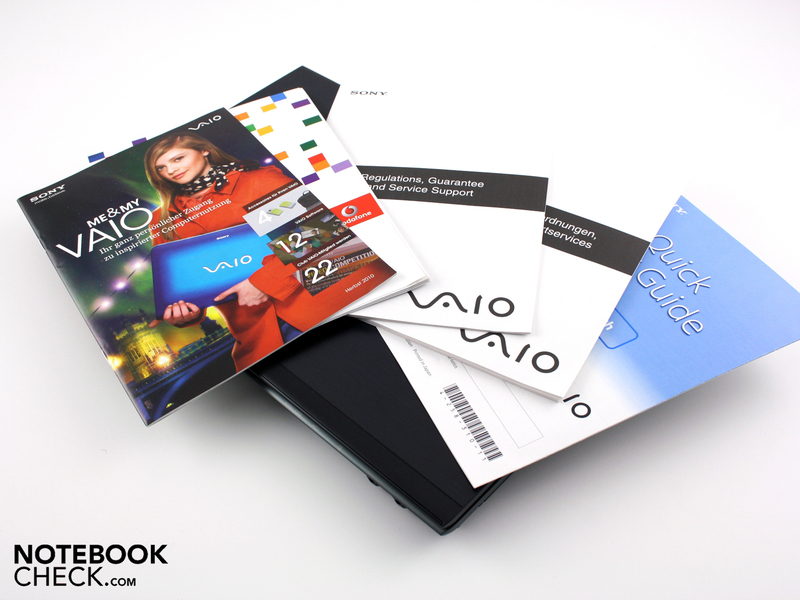 The product development for a high-end subnotebook within the Vaio Z-class simply takes longer than on the 08/15 consumer. 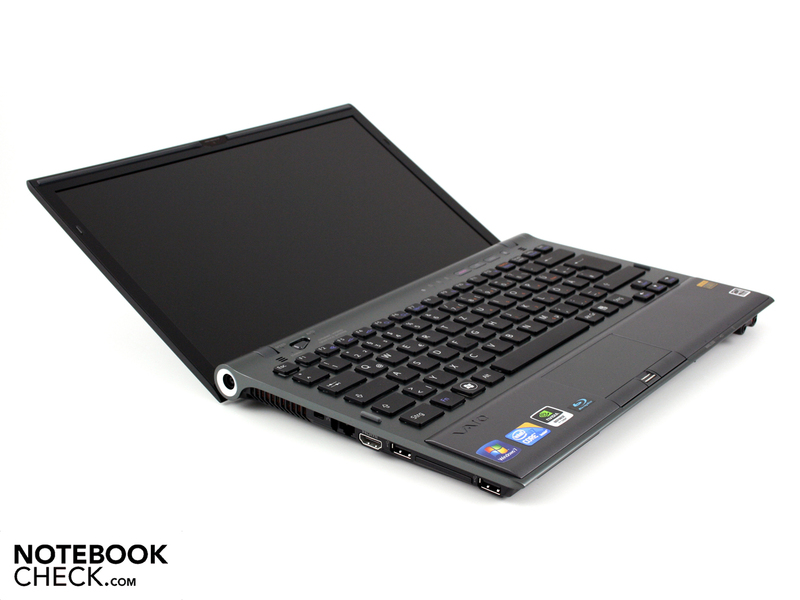 A Core i7-640M (2x2.66GHz) suitable for a light notebooks and a hybrid NVIDIA GeForce GT 330M in combination with six gigabytes of memory should ensure for fast computing. But the operating speed really gets its boost from the 256GB SSD-memory. This comprises a whole four 64GB Samsung-memories which are bundled via Intel Raid 0. Sony calls this Quad-SSD and aficionados know that Raid 0 is geared toward the best-possible acceleration (without redundancy). Our expectations of Sony's VPC-Z13Z9E/X are accordingly high. The previous Vaio VPC-Z11X9E/B (04/2010) and VPC-Z12M9E/B (08/2010), which featured RAID 0 bundles of 2x64 GB Samsung and Toshiba-SSDs respectively, were already able to move to the front of the pack of all notebooks thanks to their strong application performance. 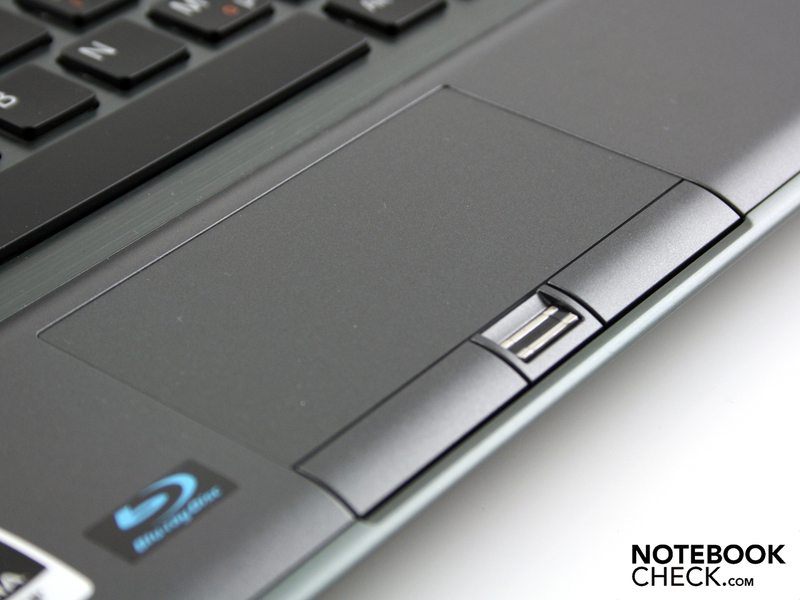 We should reiterate: That's at the front of the pack of ALL notebooks we've reviewed including the gaming-elite. 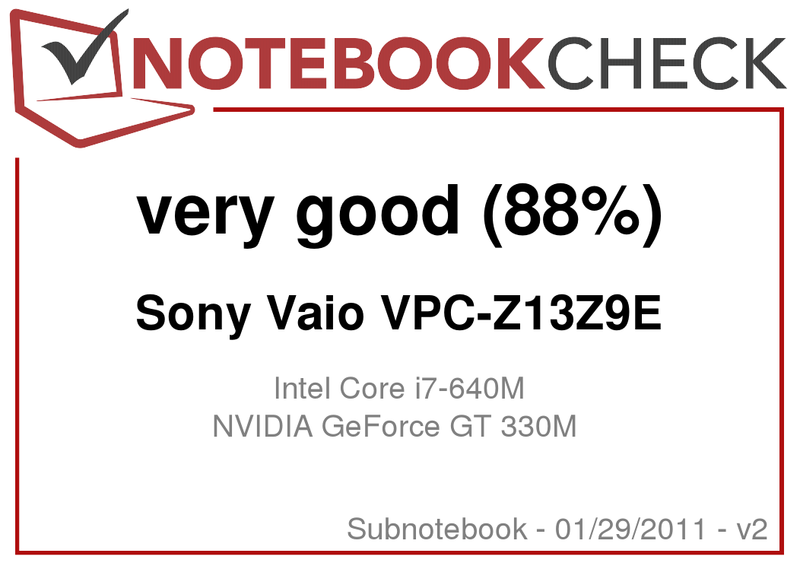 Find out in our review whether the Quad-SSD Vaio Z13 delivers the same level of kudos, or even better values. 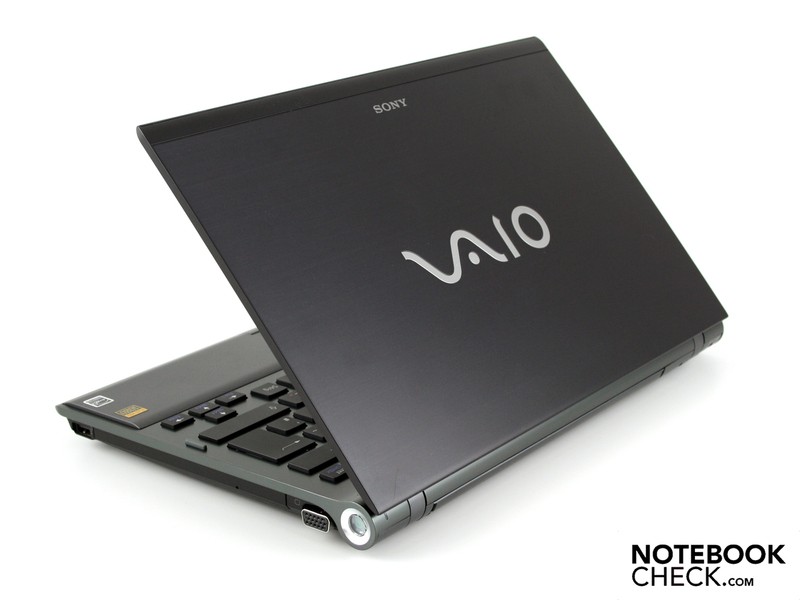 Regarding the case, we refer you to our previous test of the Vaio Z12 from August 2010. We have before us the same chassis in terms of color, optics and construction. Considering its low weight, the carbon fiber, plastic and aluminum construction is reasonably rigid. But the palm rest and base plate, both of which can dented a great deal, shouldn't really be allowed in this price class. While nothing has changed in its construction, there also haven't been any updates made to its connections and switches. 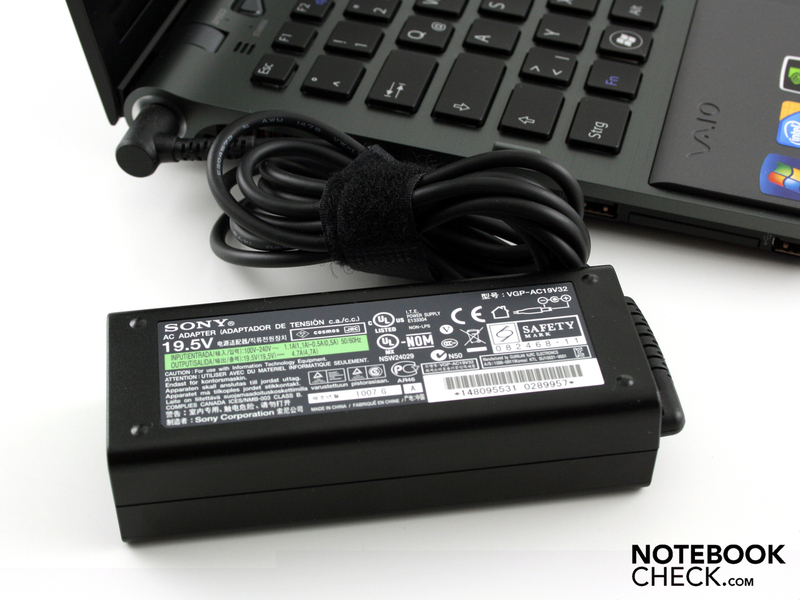 We refer you to the previous VPC-Z12M9E/B (08/2010). Also internally, the Gigabit Ethernet controller (Intel 82577LC), the WLAN module (Intel Centrino Advanced-N 6200), the Bluetooth 2.1+EDR module and the 3G-module (HSDPA Qualcomm Gobi 2000) remain the same. Vaio Care (accessed through Assist button) and Vaio Control Center are the Z13's most important admin-tools. 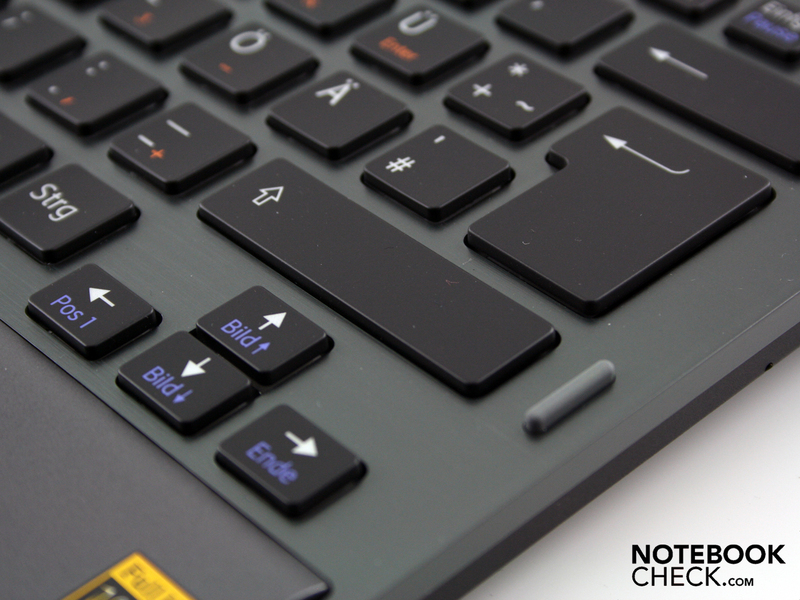 The latter deals with hardware-related functions such as the light sensor, power settings, special keys or illuminated keyboard. 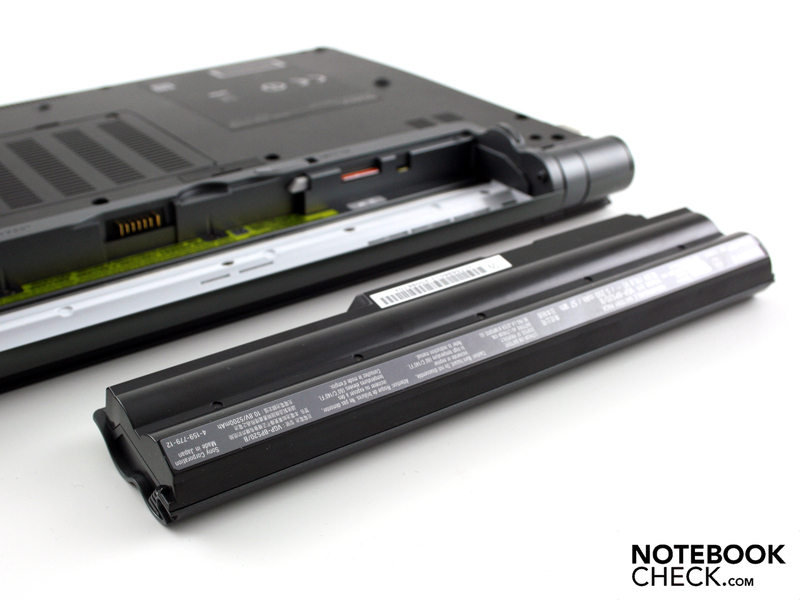 Once again, we sent the reader of the Z12M9E/B’s previous test. 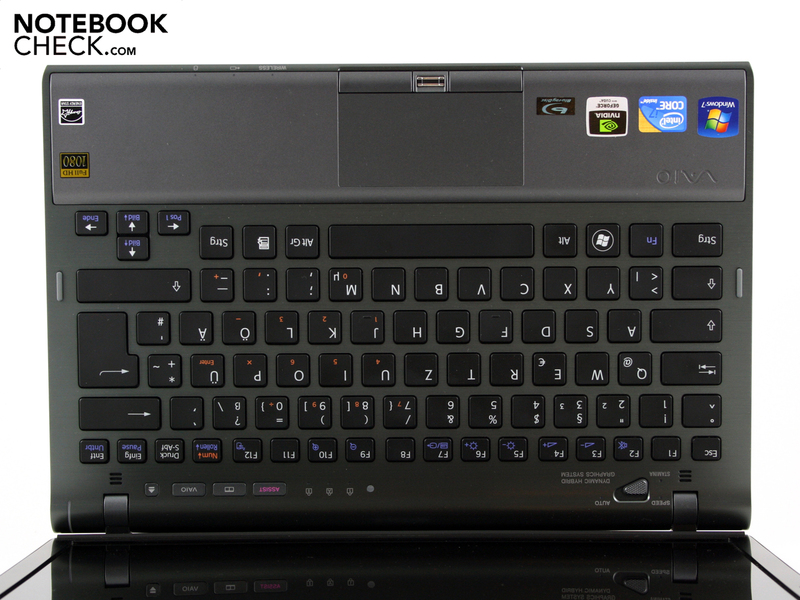 The positive characteristics, for example the stable key area and generous key spacing, are also still there as is the version of the Synaptics touchpad V7.4. We wanted to put the display through the normal row of tests as it represents a highlight not only in the field of subnotebooks, but also in respect to ALL notebooks. The designation WUXGA Non-Glare stands for a resolution of 1.920x1.080 pixels, which is extremely seldom in such a small form factor. The display was given an anti-glare finish for reflection-free use. 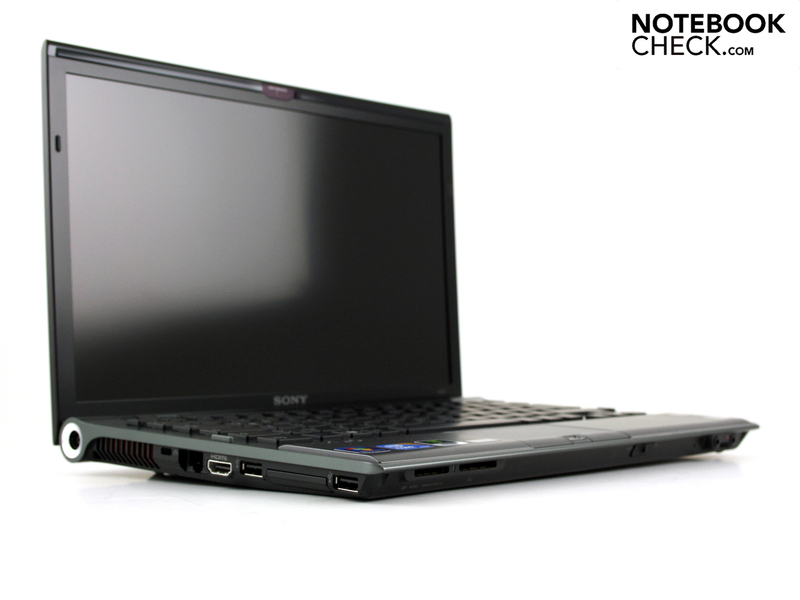 The display, read out as "Vaio LCD" (Sony: Vaio Premium Display), serves up a high contrast-ratio of 773:1. In practice, this makes for sharp, luminous colors seldom seen in the notebook-world. But what's really surprising is the extremely good color space for which we created an ICC-profile. The following ICC-graphics show the tester (colored) in comparison to the sRGB-, AdobeRGB- and WideGamut-standard (transparent) typical in picture editing. 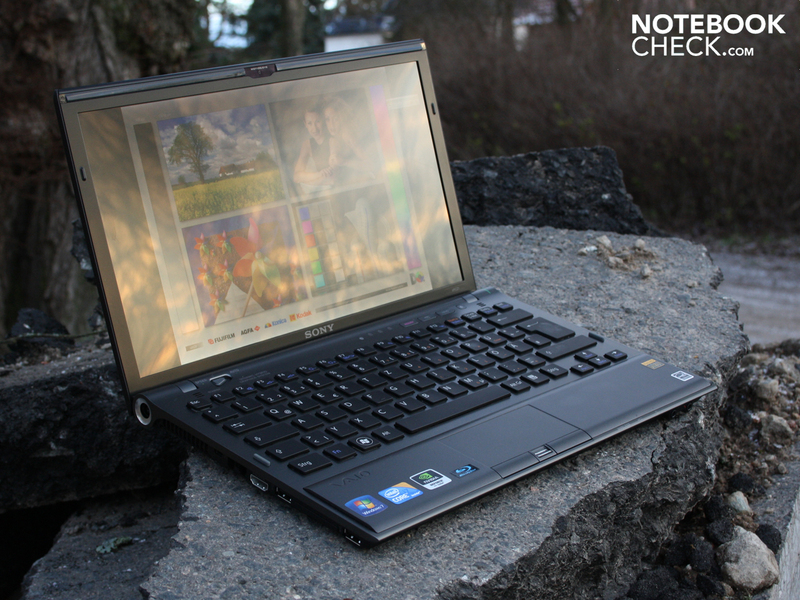 Apart from the WideGamut, the Z13 is right on the ball with the standards. 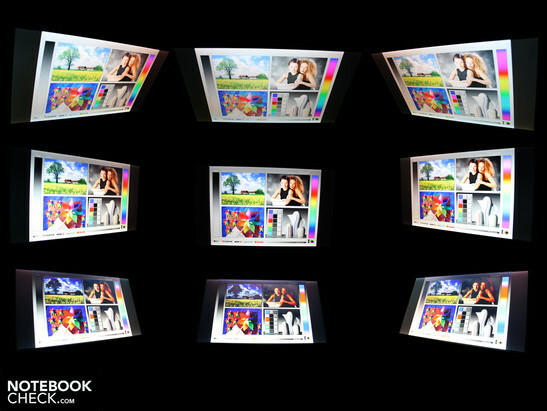 The extensive color space of the Z13 trumps the much-cited MacBook Pro 13 1020-04 display as well as the Radiance Infinity Display of the HP Envy 14-1010eg. 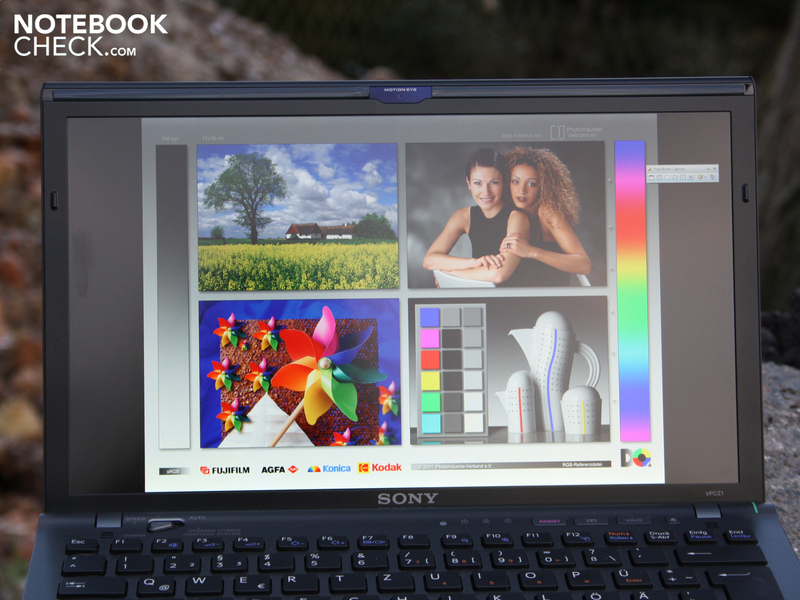 The Z13 only has a tough time of it against the enormous color space of the HP pro-workstation EliteBook 8740w (DreamColor). As a mobile tool, the Z13 can mutate into a universal weapon in the form of a portable office. In addition to the anti-glare treatment, this also entails a respectable illumination (luminance) of the display panel at 236 cd/m². At points, the panel achieved a concentrical 240 to 243 cd/m². Illumination is provided by LEDs which deliver an even distribution of light. 95% illumination bears witness to a rarely-achieved homogeneous distribution of light. The brightness of the panel can be automatically adapted via an ambient light sensor. Depending on the brightness of the room, the sensor determines how bright the panel must be illuminated. Under glaring sunlight, the sensor sets the luminance to its maximum. 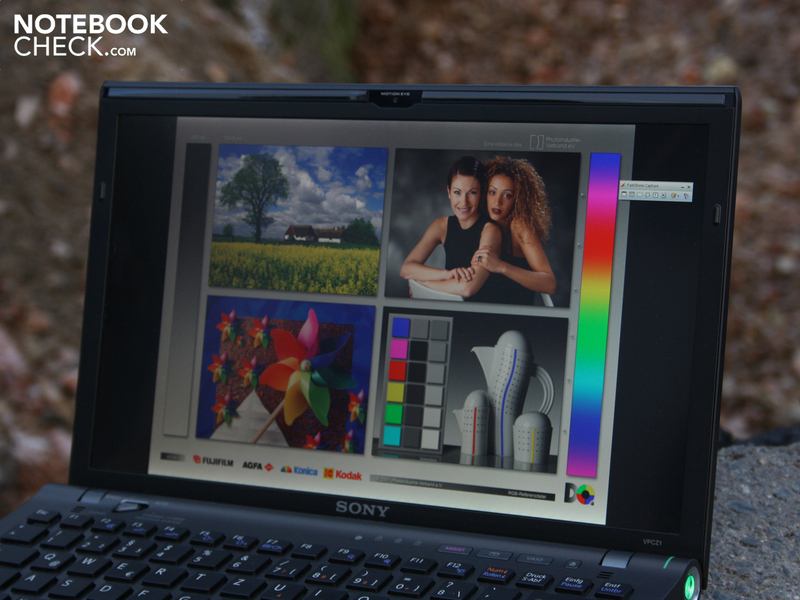 We deactivated (Vaio Control Center) the ambient light sensor for measurements and photo shoots outdoors. We could only try out its use under sunlight on a dim winter's day. Here we could easily capture the semi-anti-glare on camera. One could imagine it as a glare-panel which is streamed with a silk-matte glaze. Because of this, reflections from surrounding lights don't disappear entirely, yet they become diffuse and less annoying than before. The advantage over a "normal" matte display lies in its ability to retain the brilliant, luminous color effect. The horizontal viewing angles are the most generous. There are no color distortions (ghost images), regardless of how far one's eye moves to the left or right (85 degrees). The TFT merely dims. But we can only move our eyes up to 15 degrees vertically. After that, the colors invert considerably. 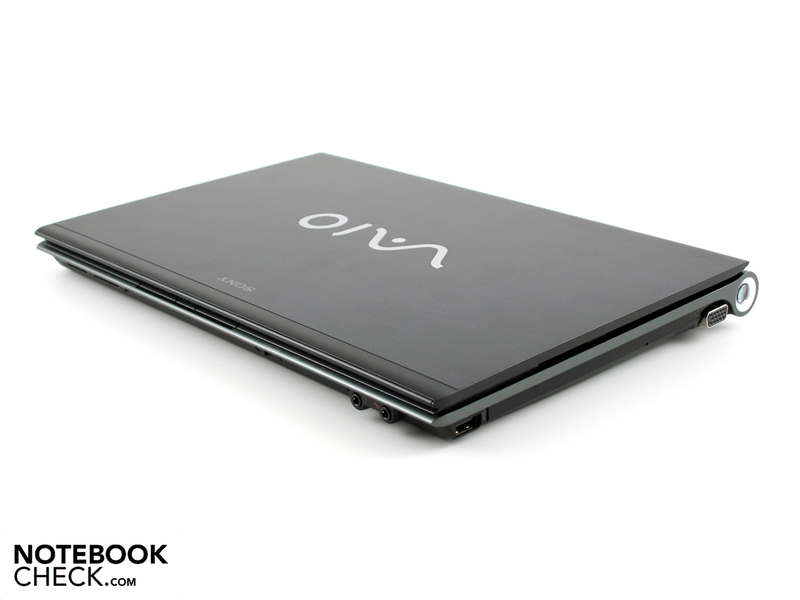 The Vaio-panel is comparable to most other laptops on the market in terms of its limited vertical viewing angles. 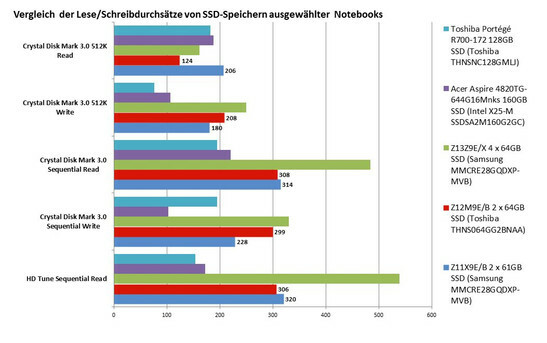 Two years ago, Low Voltage processors (LV) modeled on the Core 2 Deo SU9600 were still dominant in high-end subnotebooks. While the LV-CPUs are still around (ex. Core i7-620UM), many manufacturers have consistently turned to a standard-CPU with 35 watts of TDP. The Core i7-640M used here has two cores which clock between 2.80 (standard) and 3.46 GHz (Turbo Boost). That sounds like a great deal of energy use, but the Arrandale-CPU can lower the clock-rate to a frugal level of 1.33 GHz at idle. 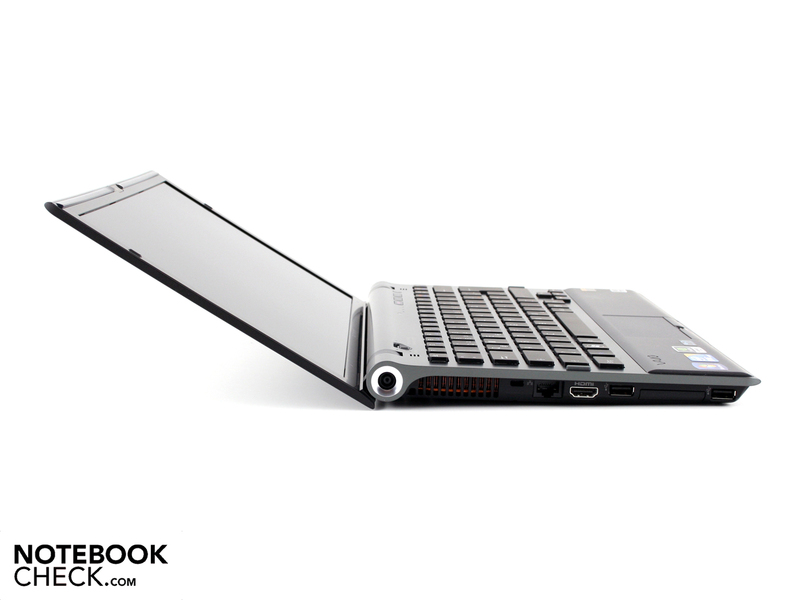 The dynamic over-clocking with Turbo Boost, which offers the maximum clock-rate in single-core renderings, ensures that the Vaio Z13 is equally well equipped for both multi- and single-core applications. Hyper Threading helps further in multi-core renderings (operating system, simultaneously run Office programs, video/audio conversions). With this, four threads can be computed at the time time, an effect which is achieved by supplementating each real core with an additional virtual one. Energy-saving, shock-resistant and lightning-fast, these are the characteristics attributed to the four flash-memories from Samsung (MMCRE28GQDXP-MVB, 64GB). More specifically, four of the SATA-SSD-modules are combined through an Intel Raid 0 controller and should ensure fast write-read processes. Physically, a 2.5" SATA "harddrive" is housed in the case. Raid 0 is performance-oriented (Striping), whereas a Raid 1 would take care of redundancy and thus for security (mirroring). 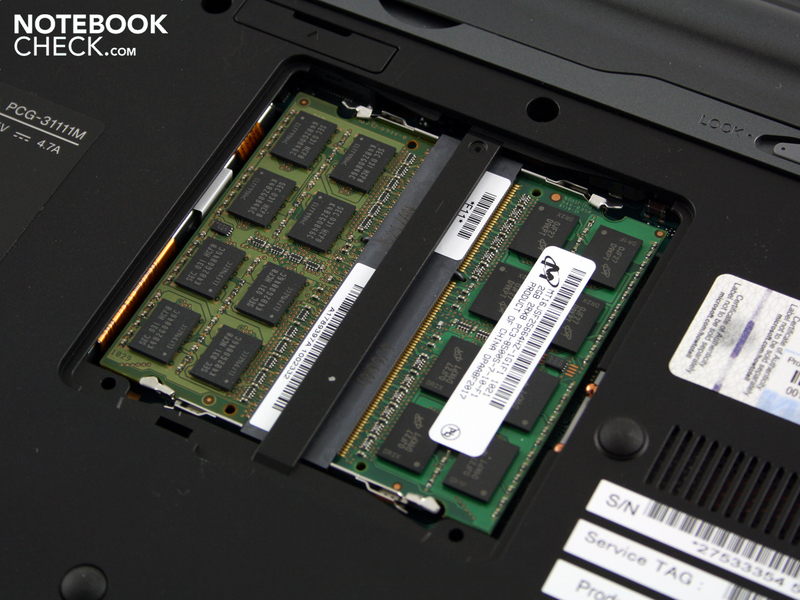 Find out more on the 256GB quad-SSD in the Harddrive section. 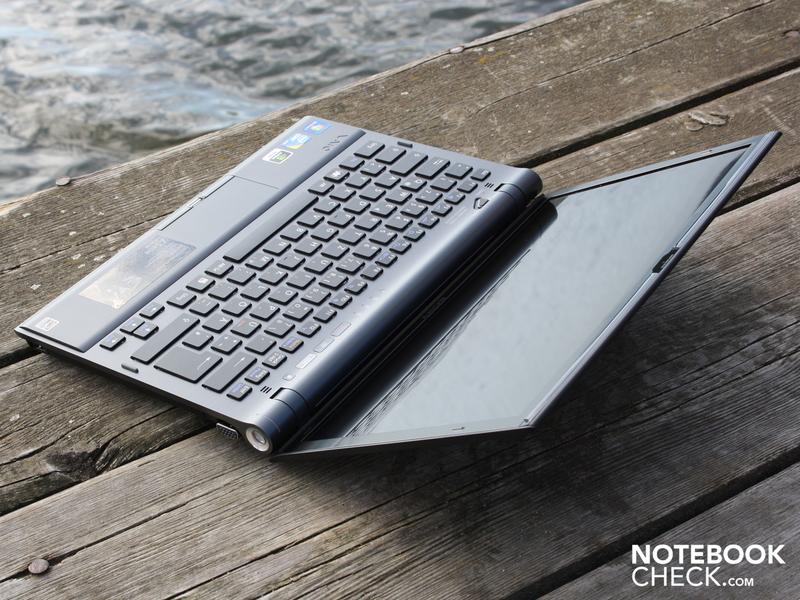 The Nvidia Geforce GT 330M is unusually potent for a subnotebook. Like on its Z12 predecessor, this can be deactivated via the hardware 3-deck switch (Graphic Switch) to the benefit of an Intel HD or a hybrid-autonomic. More information on the graphic cards can be found under Gaming Performance. The memory controller in the i7-processor can address up to eight gigabytes of DDR3-RAM. The Z13 doesn't use all of that and occupies the two additional slots with 1 x 2.048MB and 1 x 4.096MB DDR3 RAM (PC3-8500, 533MHz). The Z13 scores with its dual-core i7-640M as follows: The processor-testing Cinebench R11.5 (64 Bit, multi-core computing) got 2.4 points in the test system. 520M- and 460M-CPUs come out with around 2.2 points (low standard clocking). With its 520M, the Z12 predecessor achieved only 2.17 points. There is a clear disadvantage when compared to the quad-core 720QM (45 watts TDP, unsuitable for a subnotebook): 3.0 points (Samsung NP-RF710-S06DE). The i7-640M also beats the lower clocking 460M (Standard 2.53, Turbo 2.8 GHz) from the consumer squad in single-core computing. The latter achieves up to 3.839 points (Cinebench R10 Single Core 64 Bit, Aspire 5820TG). The i7-640M in the tester manages 4.569 points (+19 pro cent compared to the 460M). 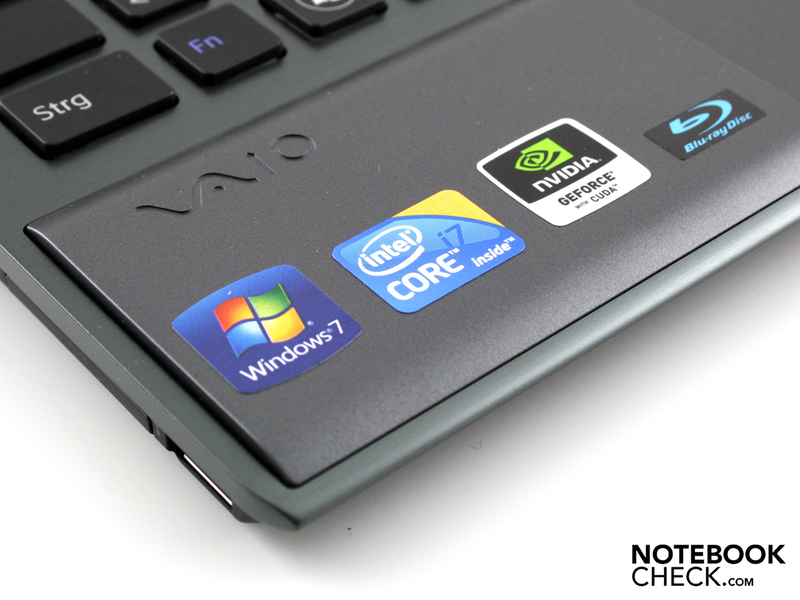 Compared to the 520M (3.500 points in the Vaio Z12), it is clear that the i7 can also compete. How does this computing performance manifest itself in an interplay between CPU, graphics, working memory and SSD? 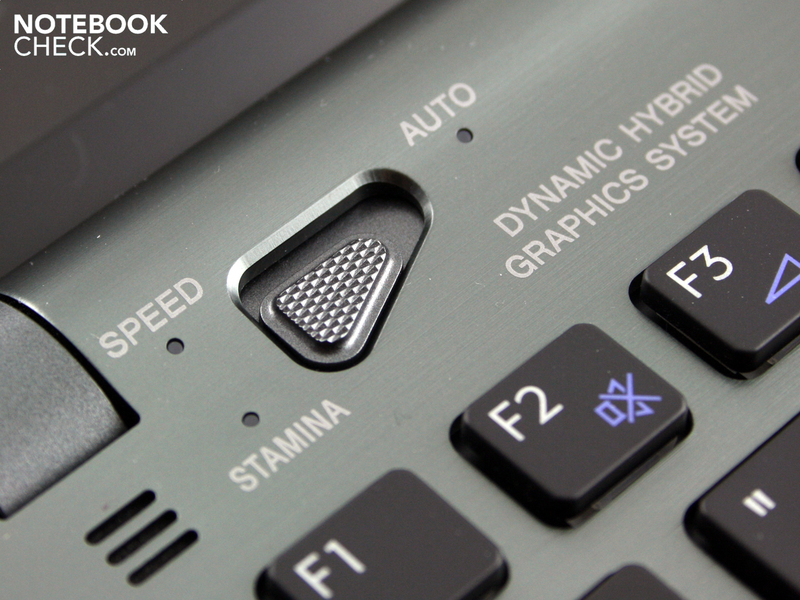 The PCMark Vantage and the PCMark05 provide us with answers. The overall score of 9.700 and 10.087 points respectively are very strong, but not as good as expected. 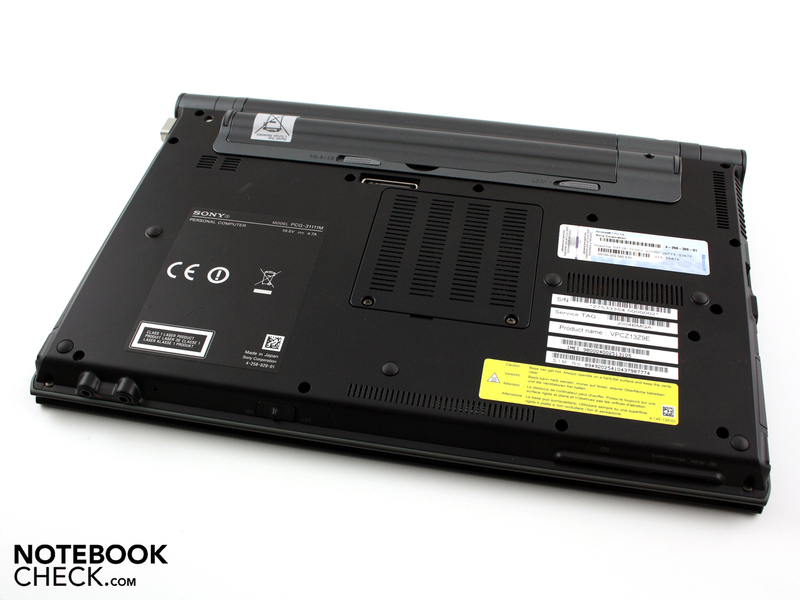 The considerably less-expensive consumer Aspire 4820TG pulls in 10.809 and 11.325 points respectively (Intel X25-M SSD). The previous VPC-Z12M9E/B with its RAID 0 comprising two 64 GB Toshiba SSDs also achieved a few points more, but only in the PCMark Vantage: 10.245 and 8.082 points (PCMV/PCM05). Still, together with other SSD notebooks, our Z13 tester takes a leading position in the range of 9.000 to 13.000 PCMark Vantage points. The reason for that strong result in application performance is essentially the fast access of Quad SSD. They drive up the HDD score of the PCMark Vantage to 13.055 points. Rapid access puts the music, productivity and communication scores way up there. The productivity score is at 9.818 points. 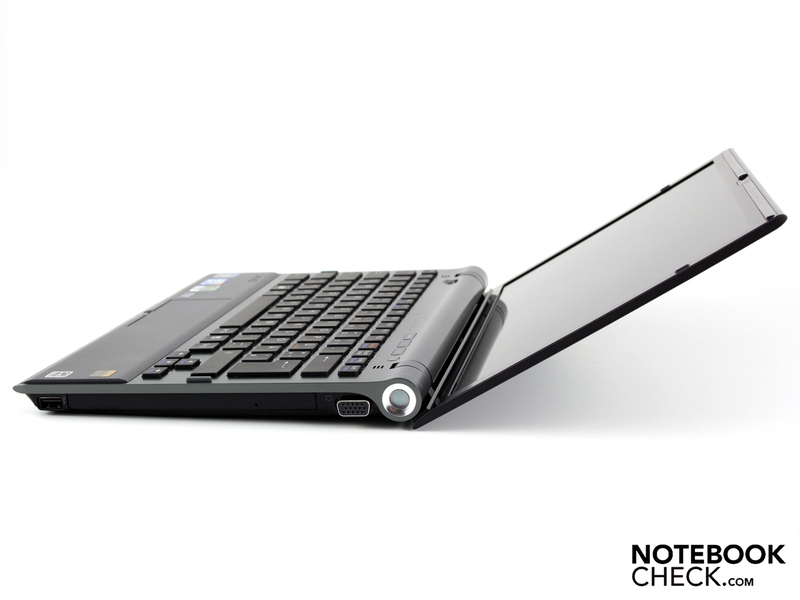 Strong notebooks with rotating harddrives (7.200 rpm) come out at best around 6.200 points (ex. 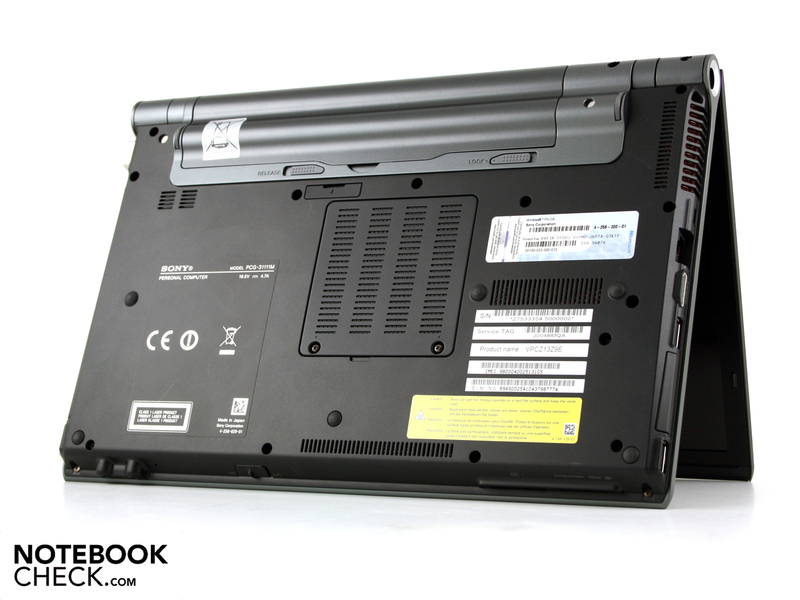 HP Elitebook 8540w). The question once posed of whether the RAID 0 package of 4 x 64GB SSD (Samsung MMCRE28GQDXP-MVB) offers an even better performance than the 2 x 61GB Samsung flash-memory in the VPCZ11X9E/B or the 2 x 64GB Toshiba memory in the VPCZ12M9E/B can not be answered. The measurements of the CrystalDiskMark 3.0 and the HD-Tune attest the superiority of the Quad SSD in the tester (green bars = Z13 4x64GB). 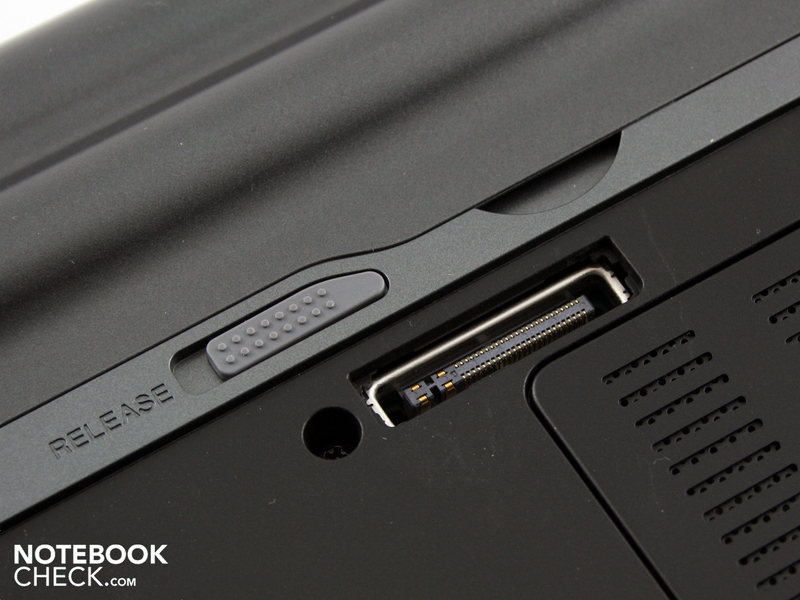 The strengths of the Quad SSD lay in its sequential reading. But as soon as the blocks have a smaller dimension, for instance 512KB, the test systems seem quite similar. This seems to be the reason why our tester by no means took away the best HDD score in the PCMark Vantage: 13.055 points. 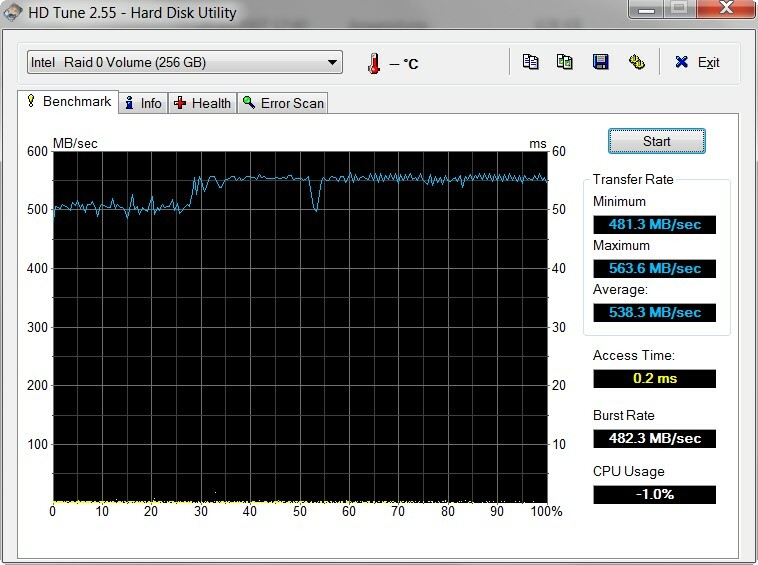 The Z12 with its RAID 0 comprising two Toshiba SSDs achieves here a brilliant 24.467 points. 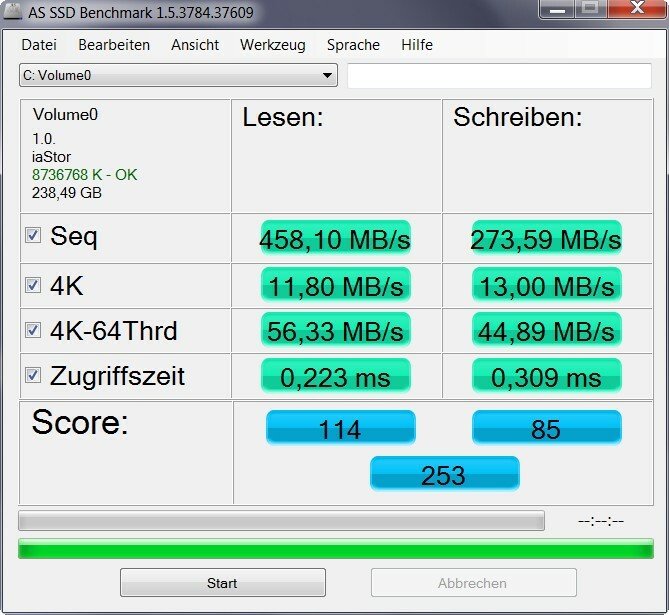 The Z11 with the same Samsung SSds, but only two of them, gets an HDD score of 17.406. When all this bean counting ends, one thing is clear. Typical notebooks with rotating 5.200/7.200 rpm HDDs are forced to fly the white flag of surrender, regardless of which of the SSDs named here they go up against. A now outdated Nvidia GeForce GT 330M with 1.024 MB of DDR3 memory is responsible for its dedicated graphics. The core clocks with only 450 MHz, and the memory with 700 MHz. Sony clocks the GPU quite low, as typical values would be 575 / 790 MHz. The Z12 predecessor had a GPU clock-rate of 475 MHz. With that, the GT 330M from Nvidia's mid-range (3xx-series) computes only on the level of a GT 325M. This fact is highlighted in the gaming tests. 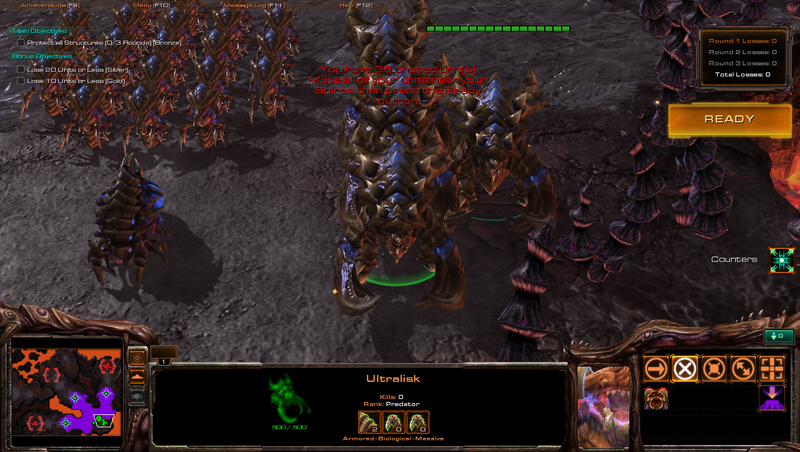 The 3DMark2006, which asseses the graphics-performance, ended with 5.500 points. In fact, a GT 330M can easily achieve over 6.000 points. The Z12 predecessor with its weak 520M-processor achieved 5.569 points. In that respect, the test system falls far short of the level of a Mobility Radeon HD 5650, which depending on the CPU support gets between 6.500 and 7.000 points. 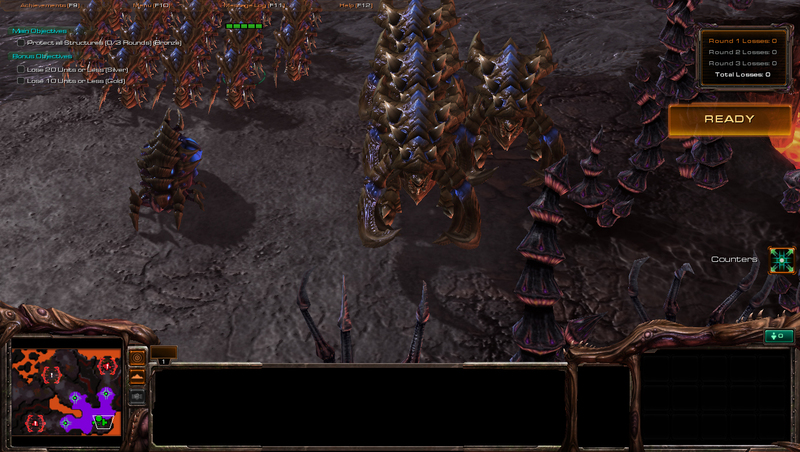 Playing the real-time strategy game in high and highest resolutions demands strong GPU-support as well as a fast multi-core processor (controlling and KI of many smaller components). The game is only playable with a fluid 33 FPS when on reduced details (medium) and with a medium resolution (1.360x768) . On maximum details and full-HD, the Z13 delivers an unplayable 12 FPS. The underclocked GT 330M (core 450 MHz instead of 550 MHz) limits the gameplay and reduces the framerates. A stronger Core i7 and a faster SSD don't help here either. 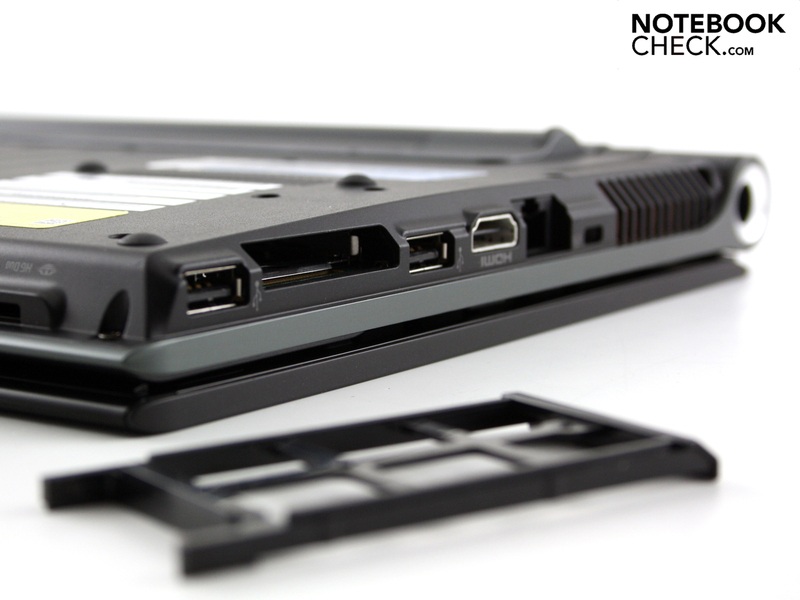 Nevertheless, the GT 330M still offers sufficient gaming performance for a light subnotebook. 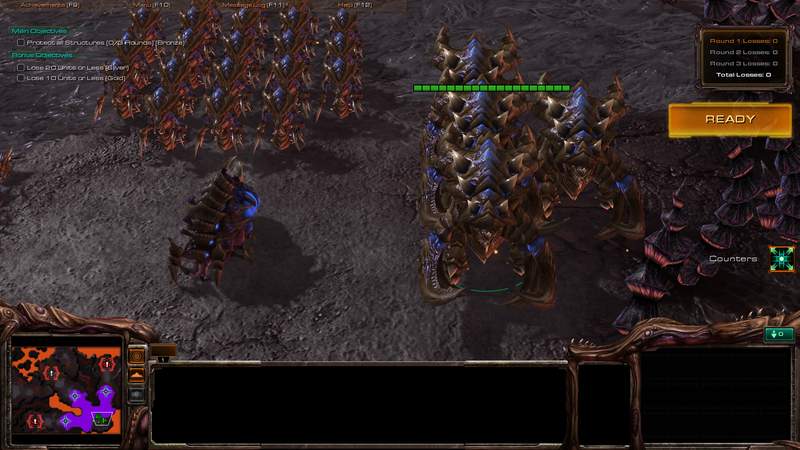 Current games can still be played in low details and, more or less, in middle details as well. Occasional gamers will find countless older or less-demanding current games which run perfectly smooth and in high detail. Surfing the Internet, writing emails or creating Excel-tables; these light tasks hardly tax the system and run at the lowest rotation (31 dB(A). That also goes for the Speed-Mode with active GT 330M). In the stress-scenario the cooling system ramps up to 41 dB(A). That's impossible to ignore but still acceptable. We achieved this volume in the 3DMark2006. With a constant processor load on all the cores (Prime95) the cooling system fluctuates between 47.9 and 49.4 dB(A). That level of noise is already very bothersome. A stresstest comprising Furmark and Prime95 not only loads the Core i7-640M on all four threads to 100 percent computing, but also makes the shaders and GPU work at full power as well. Here the cooling spins to its max: 52.1 dB(A). When the volume is low at idle, so is the temperature on the surfaces. The average heat development on the top surface is around 24 degrees. The base plate makes an equally perfect impression with 25 degrees (average). Although the average temperatures rise considerably under maximum load over several hours, they don't become threatening. We measured 38 degrees Celsius near the fan vent. For a small subnotebook with a strong Core i7-CPU and a dedicated GPU, those are remarkably low temperatures. The temperature sensors on the processor registered a maximum of 94 degrees on the CPU (stresstest). In light Office-operation, this remains at only 65 degrees. The GPU heats up to a maximum of 81 degrees. 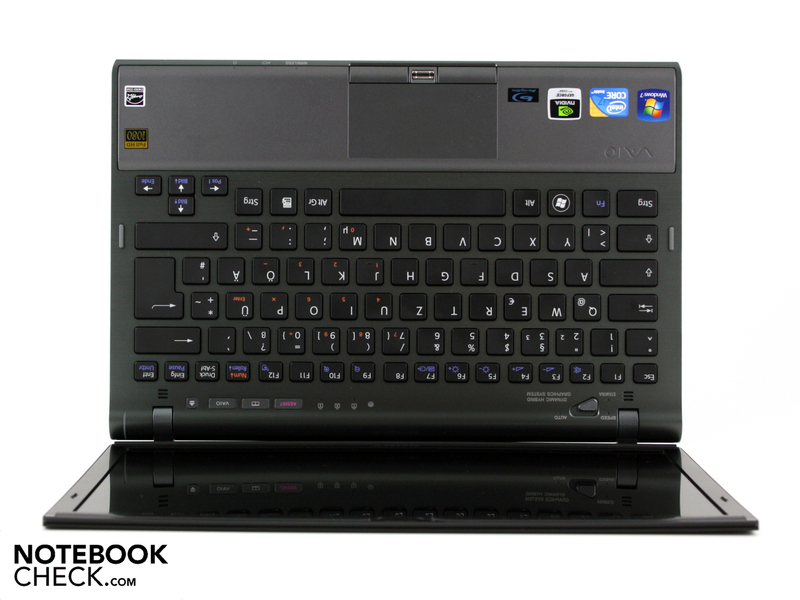 The mini-stereo-speakers are housed above the keyboard and deliver an extremely high-pitched body of sound. The volume also doesn't seem particularly high. Still, the speakers don't produce any scratching even at a maximum volume level. The audio out- and inputs out front functioned flawlessly and without rustling in testing with two Yamaha external speakers (YST-M20SDP). The 13.1-incher is equipped with a 57 watt-hour battery (5.200 mAh). This keeps the Vaio on its legs for a good four hours (257 minutes) when surfing the Web (per WLAN). We measured this runtime in Stamina mode (Intel HD) at around 100 cd/m² brightness. 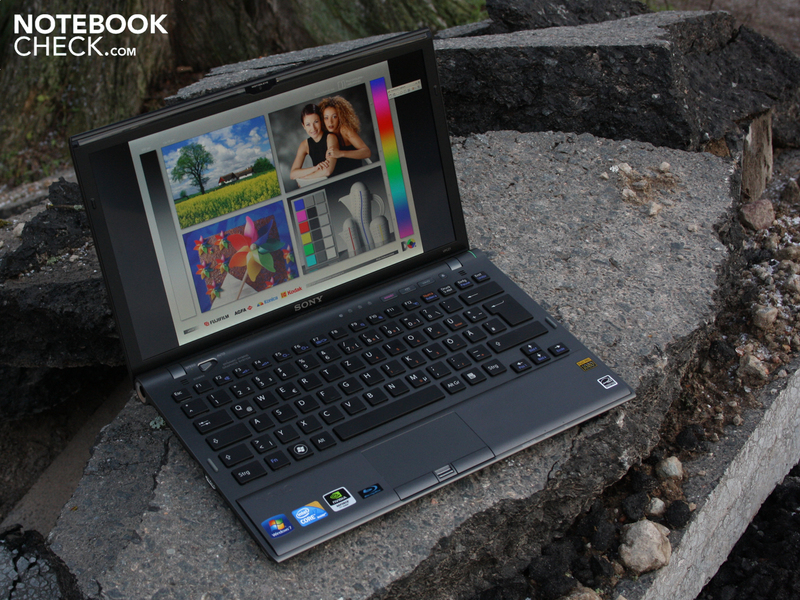 With reduced brightness and using only Office programs, the Vaio Z13 can hold out somewhat longer. The Reader-Test showed this with 399 minutes (text reading with a min. brightness; 6:39 hours). A DVD film runs three and a half hours (217 minutes). That is enough for at least two films. The hardware has to decode more for a Blu-ray and the runtime sinks considerably to 152 minutes (2:32 hours). 3:30 hours must pass before the next mobile session can begin as that is how long it takes to fully charge the battery. The Z13 is quite frugal. The (lowest) current consumption at idle is 11 watts (Stamina mode or Auto; Intel HD). The maximum idle-use is at 24.9 watts. For this, all power-consumers are active (radio, max. luminance of the TFTs, high-performance mode). The Z12M9E predecessor was even more sparing in this respect (7.5 watts in Stamina mode). It goes the other way during load-operation with Geforce GT 330M activated. Here in Speed mode, the 3DMark2006 records 86.9 watts. It even rizes to 84.2 watts in the stresstest. The compact 90-watt power pack (285 gramms) is appropriately dimensioned for this and rizes to a maximum temperature of 48 degrees when under high energy use. 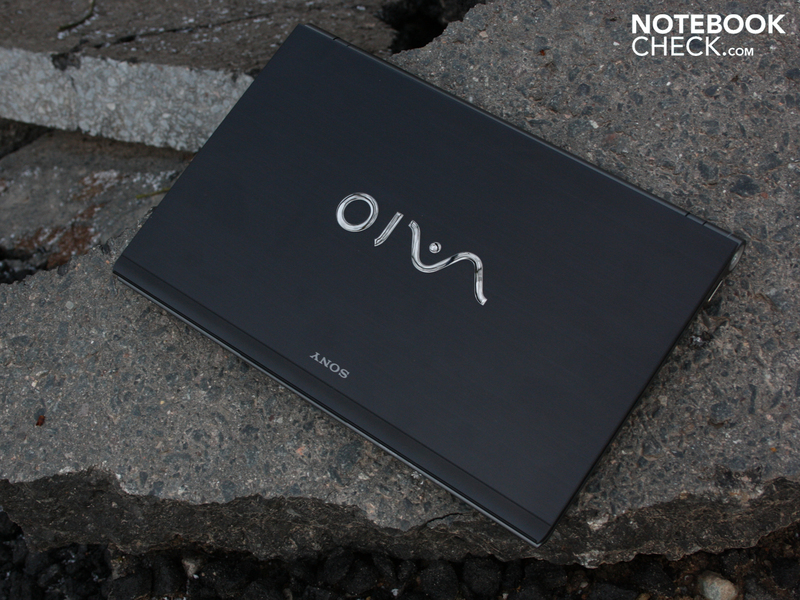 Sony has attempted to garner its Vaio VPC-Z13Z9E/X with any- and everything available to ensure an impressive notebook-experience. With the fast Core i7-640M (2 x 2.8 GHz, Turbo Boost, Hyper Threading) and the Geforce GT 330M (throttled), one gets potent standard-hardware in a light case. But it is above all the Raid 0 package of four 64 GB Samsung SSDs which make a sprinter out of the 13.1-incher. Yet all that comes with a hefty price tag of 3.299 Euros. Features befitting of the high-end business class include the docking port, typer-friendly input devices (illuminated), the internal 3G module, the Blu-ray driver and the upscale construction. The battery life is quite good at four hours (WLAN surfing). 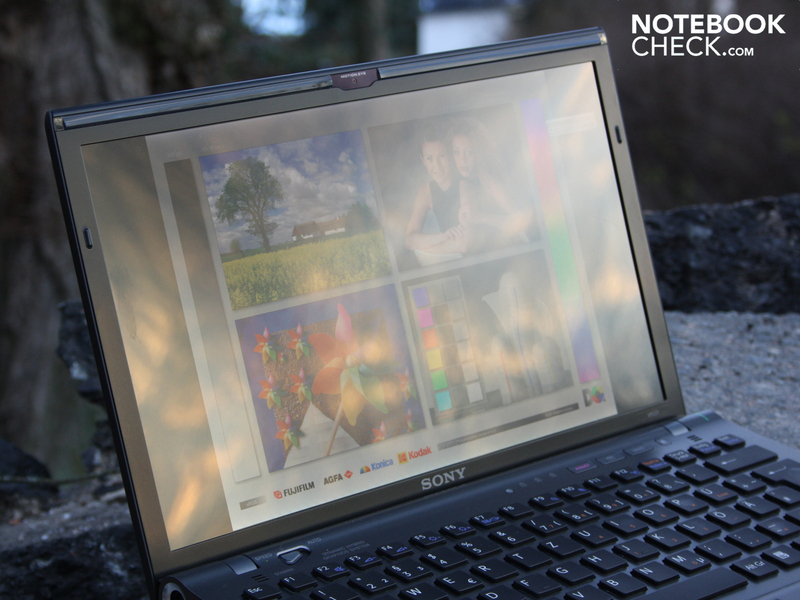 The 13.1 " full-HD display panel offers the kind of resolution and quality (color space, contrasts, brightness) which we normally only expect from workstation-laptops or a handful of gaming-notebooks. With its layout and construction, the Z13 is also capable of tackling these associated fields of work, but the question then becomes which design engineers or picture editors would put up with the 13.1" form factor? All other users profit in any event from the overview on the desktop, its pin-sharp colors, its viewing angles up to 85 degrees (horizontal) as well as its anti-glare finish suitable for outdoors. 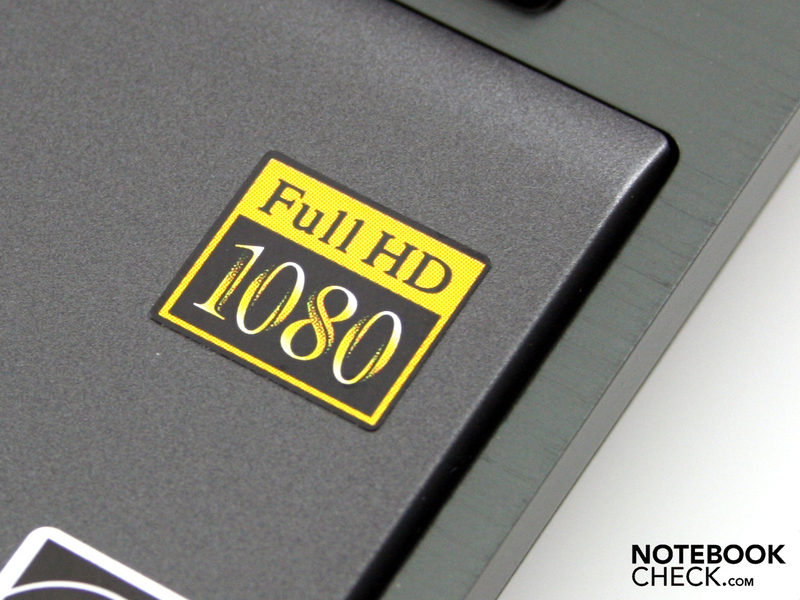 There is currently no better subnotebook-display to be had at this price. The few weaknesses lay in the loudspeakers under mid- to high load. Without Optimus, switching graphics means there is a constant, annoying interuption of work. Furthermore, a dentable palm rest and base plate are unaccetpable for something at a price level of 3,299 Euros. Shocked by the high price, many interested buyers will surely try to forget the Z13. But there is a version of the VPC-Z13B7E/S which is affordable "for everyone". It is decently potent with the Core i5-460M (2x 2.53GHz) and the hybrid GeForce GT 330M is also on board there. But for 1.400 Euro , the buyer has to make do without such highlights as full-HD, optical driver and Quad-SSD. 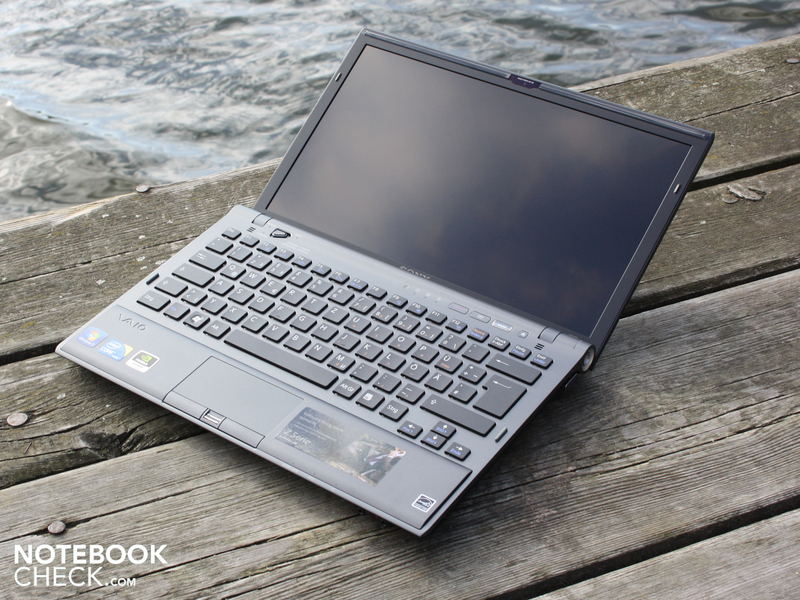 In August 2010 we put the VPC-Z12M9E/B through its paces and bestowed the light subnotebook with an A-rating. Like on the Z11 and Z12 predecessors, Sony did NOT impliment the graphics switch Optimus with the Geforce GT330M, but rather its own switchable solution. 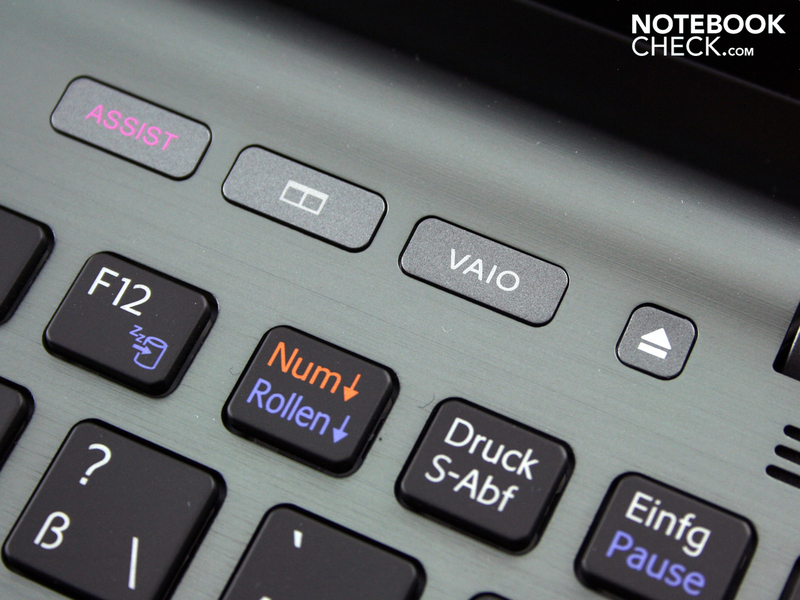 Special keys call on Vaio Care (Assist) or self-defined actions (mute, brightness, programs etc. ). The base unit weighs a scant 1.447 grams, the ideal partner for mobile excursions? For the most part, yes, as the stongly-constrasting, bright TFT was given a light anti-glare treatment. But it isn't completely free of reflections. 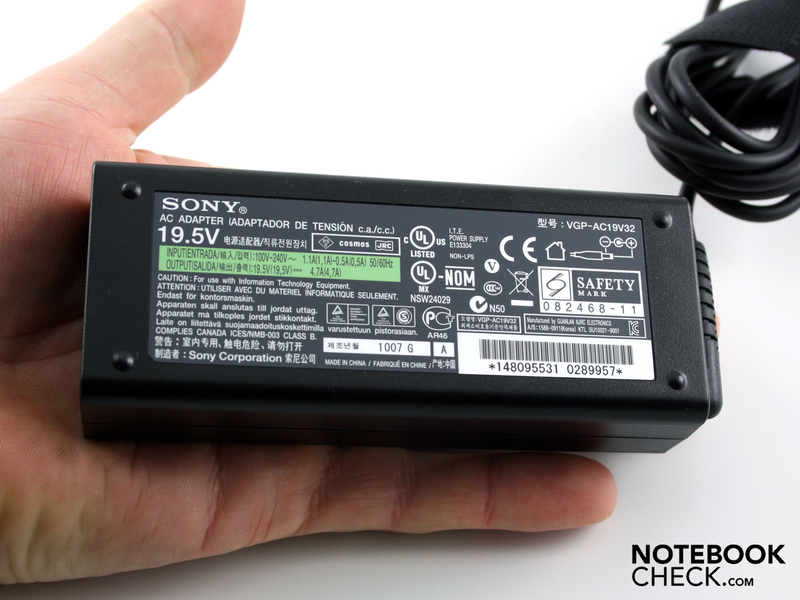 Sony splashed out on a relatively strong accumulator with 5.200 mAh (57 Wh). without needing the relatively weight 285-gramm-power pack (94 watts). which reveals the DDR3-memory. Sony built in 2 + 4 GB modules of DDR3-RAM. The user has to burn the recovery medium theselves via Vaio Care. As is the docking-port for convenient connection of peripheries, network and energy. An internal 3G-module (Qualcomm Gobi 2000 HSDPA) is obligatory for the high-end demands of the Vaio Z13. In terms of connections, thought was even given to expandability via the ExpressCard34-slot. Now the days are shorter and almost six months has passed. 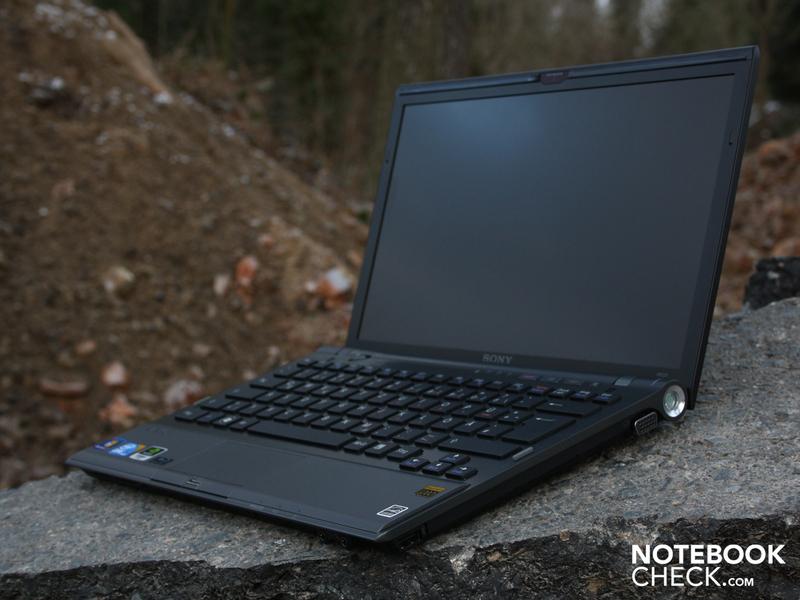 The successor Sony Vaio VPC-Z13Z9E/X goes to the start-line. We need not make much mention about its exterior. The 13.1-incher hasn't changed a bit here. And that's also not necissary as the light and for the most part stable carbon fiber-aluminum construction is still a highlight. This deal doesn't just peak the attention of high-definition fans: full-HD resolution in a 13.1-incher? But also Raid 0 SSD (4x64GB! ), Core i7, Blu-ray driver & hybrid Geforce GT 330M ready it to climb the Mt. Olympus of subnotebooks. Can so much performance be properly cooled in a small case and without noise irritation? How potent the cooling system can be, an optical driver (Blu-ray Reader) resides in the chassis. 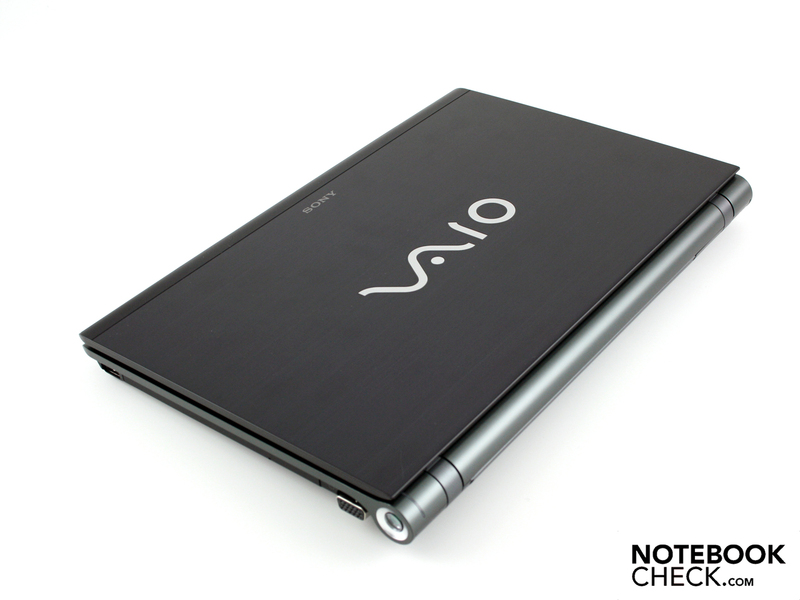 the Vaio VPC-Z13Z9E is a workhorse for business leader and hard-working consumers. 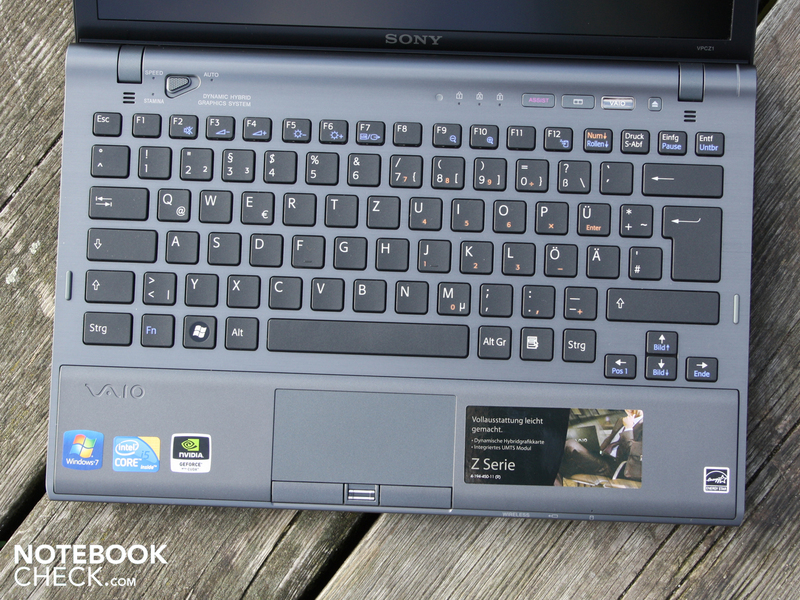 Sony Vaio VPC-Z13Z9E/X: A typist-friendly keyboard with a generous layout. A TFT with workstation-quality and resolution on a small 13-incher. With Nvidia, the annoying black display and waiting time when switching GPU could have been avoided. The Quad SSD no longer appears to perform as well in practice (PCMark Vantage, PCMark05) as does the much cheaper Intel X25M SSD in the Aspire 4820TG.